On our way back from our short break in Sunderland last month the OH and I stopped off in Middlesborough for a few hours so that I could call in at Teesside Archives. Since early 2013 I have been trying to trace the whereabouts of the ships' registration documents for Hartlepool which mention my 4x great uncle Robert Elstob Hutton. Despite them appearing online in several places attributed to Hartlepool museum, on both a site called Ookl and more recently on the Hartlepool History Then and Now site, when I contacted the museum they could not find the relevant documents. However a random search on Google a few months ago turned up a reference to them in Teesside Archives - they must have been transferred to this regional Archives but no-one at Hartlepool can remember! I immediately contacted Teeside and enquired about the documents - I received several helpful emails and made a booking to visit on the last day of our holiday. I had been told by email that the books containing the ship's registration documents (NG/SR/H/1) were very large and could not be photocopied so the OH and I went prepared to pay for a day licence to photograph the pages I was interested in. I knew of at least seven ships in which Robert Elstob Hutton owned shares and each registration appeared to cover two or more pages. On our arrival, we were told that some of the books had been digitised and that we could browse indexed CDs, printing out the pages we required. Of the four books I wanted to consult, three had been digitised but we did get the chance to handle and photograph one of these 160 year old volumes as we followed the histories of Robert's ships. Many of our printouts had to be at A3 size in order to read the small handwritten details on the registration forms, and our total bill came to £12.50 for the visit. But well worth it for the fascinating stories these documents tell. This is the story of just one ship, the brig Euxine (pronounced yook-sin). Built at South Stockton in the County of York in the Year One Thousand eight hundred and Fifty Five as appears in the Certificate of William Turnbull the Builders, dated 24 March 1855." The header of the registration gives us the date of construction for the Euxine and the place where it was built. As there are only a few days between the certificate of the builder, William Turnbull, of Stockton on Tees, on 24 March 1855 and the registration at Hartlepool on 2 April 1855, we might assume the ship was built for the declared owners. Robert Elstob Hutton of Hartlepool owns 32 of the 64 shares in the Euxine and Thomas Belk, a Solicitor, also of Hartlepool, the remaining half of the ship. Interesting to note that ships shares come in 64 parts - apparently this is still the case in English law. In the 1851 census Thomas Belk is listed as Town Clerk and Solicitor. In one of those small world moments you get in family history I notice he was born in Pontefract in 1809 and married in Ackworth in 1837 - which is about 7 miles from where I am currently sat! The Euxine is a small ship, 100 feet long and 23 feet wide with a hold depth of no more than 15 feet. Her stern is square and her figure head is a female bust. She has two masts and is noted as snow rigged. Despite this description she appears in the newspapers and Lloyd's lists as a brig, which suggests a slightly different arrangement of sails (according to Wikipedia) although it seems the two terms were becoming interchangeable by this period. The master of the ship at its registration is Robert Hutton, this is not my 4x great uncle, but rather his eldest son, born in 1829 in Sunderland. He had first gone to sea as an Apprentice in 1842 when he would have been 13 years old. 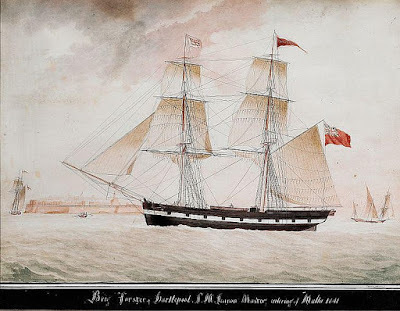 He had claimed his Mate's Certificate in 1855 when he was 21 after serving on several ships in which his father had shares, the Hotspur, the Ireby and the Acacia. He appears to have travelled all over the world, from Australia to the Arctic Circle. Lloyd's Register of Ships is shows us that there were two ships called Euxine in 1855, our ship, the brig Euxine, built in Stockton in 1855, owned by Hutton & co and voyaging under R. Hutton from Stockton to the Mediterranean and the other a larger ship, a barque, master W. Bell, voyaging from Dundee to Brazil. It is possible to follow the voyages of a ship in the 19th century newspapers now they have been made available online with easily searchable text on websites like the British Newspaper Archive and Find My Past, which both require a subscription. However you can also search a limited selection of 19th newspapers for free via a membership in some libraries - I am a member of Newcastle Library and can search the newspapers via the Internet from home. With two ships the same name in the same period the search becomes a little more diffcult, but as ship's masters are often mentioned as well a search for Euxine and Hutton limits the hits to four in the newspapers on Find My Past. On 27th August 1855 the Euxine arrived in Falmouth from Alexandria, Egypt. Her cargo was probably grain, this seems to be usual from that port. A similar voyage is reported in the Liverpool Mercury in March 1856. In June 1856 the Euxine sailed from Troon for Smyna,Turkey on the Aegean Sea. The final hit tell us that in March 1857 she sails for Antwerp, Belgium. My previous family history research had uncovered another clue to the voyages of the Euxine. 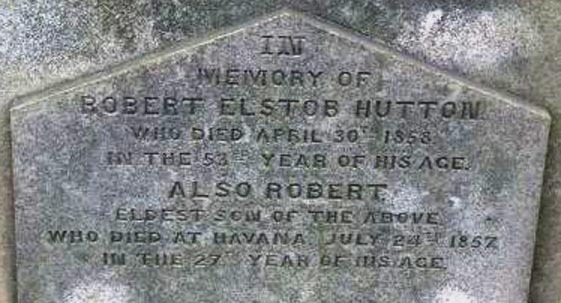 Robert Hutton is mentioned on his father's gravestone in Hartlepool Spion Kop Cemetery. As you can see from the inscription above Robert Hutton dies in Havana on 24 July 1857 aged 27 years. As the last newspaper mention I could easily find has the Euxine sailing to Antwerp in March I did wonder if Robert was still on board her when he died in Havana four months later - as it is on the far side of the Atlantic Ocean! There are over 400 hits for the Euxine on Find My Past in 1857, but many refer to the Euxine Sea, an older name for the Black Sea, and many others to a steam ship of the same name, however eventually I did find the entry that solved the mystery. The name Hutton had been indexed as Button, and the text is twisted as it wraps around the edge of the page which is why this entry had not come up on any of my previous searches. Without knowing the name of the ship Robert was sailing on it is doubtful I would ever have found this little snippet of family information. The ship appears to have been sailed home by a man called Fairburn, as it is reported arriving off the Isles of Scilly from Havana on 18 September 1857 with a master of that name. Maybe he had been the mate and had taken over after Robert died? By 1858 there are four ships called Euxine registered in the Lloyd's List. However by picking out the name of the new master, Robertson, from the list we can track our Euxine in the newspapers as we did before. Note that in this entry the Euxine is still owned by Hutton & Co. The owner has changed to T Belk by 1860. We know that Robert Elstob Hutton dies in April 1858, his shares in the Euxine must pass into the possession of Thomas Belk, who now owns the whole of the ship. Robert dies intestate so I assume the proceeds from the sale of his various ships shares and other property were divided between his wife and children. The following spring and for several years afterwards the Euxine sails captained by Alexander Robertson. The newspapers document her voyages from April 1858 with several trips to Alexandria, a mention of Table Bay which is Cape Town, South Africa and of Archangel, in the Arctic Circle. Then in 1861 disaster strikes. It seems that the Euxine, master Alexander Robertson, was returning to Liverpool from Alexandria with a cargo of beans when a storm blew up and she got into difficulties off Lytham (between Blackpool and Southport) on Monday 11 November. She was offered a tow by a steam tug, the Brother Jonathan, and Captain Robertson was sufficiently confident that this would get him out of trouble that he put a message in a bottle to the effect that the Euxine had been towed ashore and abandoned (Shields Daily Gazette 05 December 1861). Unfortunately the tow cable broke and Captain Robertson apparently declined a second hawser, saying he would let go his anchor and ride out the storm (Reading Mercury 16 November 1861). By the following morning the ship had been lost. On 13 November a body is picked up by a fishing boat off Fleetwood. It is identified as Alexander Robertson aged about 60 years. The papers in his pockets, according to this piece in the Newcastle Journal of 16 November, document his last fatal voyage. There was a receipt for £220 which was paid into a bank in Newcastle upon Tyne to the credit of Alexander Robertson on 31 May 1861 and a bill of exchange for £75 drawn in Alexandria on 7 August by Alexander Robertson in favour of Thomas Belk. Details of the documents were telegraphed to the bankers at Newcastle "in the hopes that through them the friends of the deceased may be found." The last entry for the Euxine we found in Teeside Archives was in the original volume dated 1855 to 1862 which we were allowed to photograph. "Ship lost with all her papers the 11th Nov 1861 off Lytham." The entry in the register was closed on 14 December 1861. It took me most of a weekend to put together just these few details of the history of the Euxine, and I did not examine all the entries for her voyages with Alexander Robertson in detail. However it was satisfying to see how her story fitted into my own family history, especially to see evidence of Robert Hutton junior's death from yellow fever - which I would never have found without knowing the name of the ship he had been sailing on. Thank you for reading ... I still have another six ships owned by R E Hutton to research, so I'll be getting back to you soon! As I recall, and I wrote the above over two years ago, I was lucky enough to find a listing of the ships my relatives sailed upon via documentation on Ancestry. The book, My Ancestor was a Merchant Seaman, by Watts was very useful, and at some point, long ago, I visited the Guildhall in London and looked at the Masters' Register there. I am pretty sure that when I visited Teeside that I was armed with a list of ships already. However they did have a very useful speadsheet on their system which allowed me to look up information leading me to the correct volumes in their Archives. I can only suggest that you email them direct. I did that before my visit to check they really had what I wanted. I do live in South Yorkshire, as you can see from my blog title. I would love to go to Teeside again, it was a lovely Archive with very friendly staff. One of my ancestors was an Alexander Robertson who, as far as we can deduce, was a master mariner. We know he was a witness at his son's wedding in London and, believe, he lived in St George in the East, Tower Hamlets. I believe he was born around 1800 bu the does not appear in many records. This may be because he was always away at sea. Is there any where there is more information held on master mariners apart from the certificate number, where he was born and when? If there was an address he stayed at or his next of kin listed it would be an advantage, but I do not suppose that was of much interest to the people issuing the certificate. His son was a Joseph Robertson who was also a master mariner and, again, who has very few details listed on any records.